Frédérick Gravel & Groupe d’art Gravel Art Gravel Group’s Usually Beauty Fails opened April 15th at Theatre Junction GRAND. Photo Credit: Denis Farley. Loud and assertive, this is the way Frédérick Gravel & Groupe d’art Gravel Art Gravel Group’s Usually Beauty Fails opens. The music holds us down in our seats. The dancers, whose eyes were locked with ours just moments ago, escape into fervid movement. 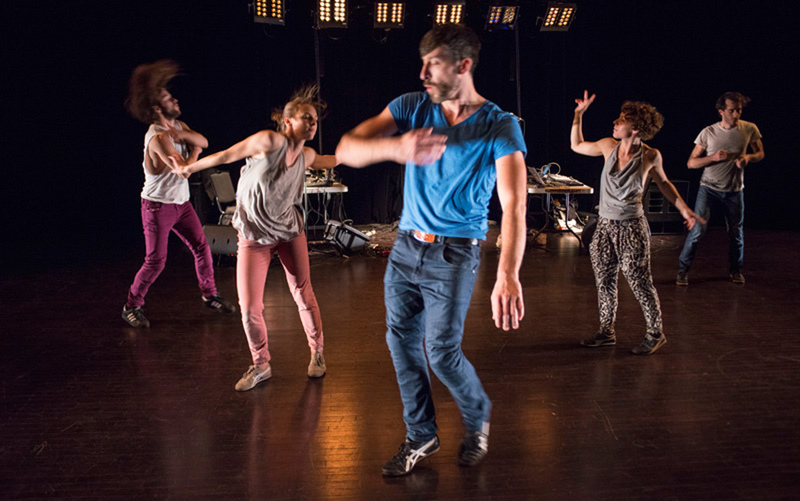 Blending dance and live music, Usually Beauty Fails is a raw display of human emotion. Parts of it, anyway. Gravel, the show’s creator, director, and choreographer, is the evening’s leading man. Taking the microphone between dance pieces, he shares his thoughts, which are largely self-deprecating, with the audience about the performance. Gravel’s charm is well received by the audience, albeit for a short while. Eventually, the audience’s laughter shifts from warm to tired and nervous as Gravel’s drawn out, wayward thoughts overstay their welcome. Gravel’s band (Charles Lavoie, vocals/guitar; Vincent Legault, guitar; Gravel, vocals/guitar) perform a varied arrangement of music that sometimes rocks out loud, then other times goes for a soft, melodic sound. The rock pieces are not particularly interesting. The acoustic pieces, on the other hand, draw us in close with simple, tender lyrics that travel smoothly thanks to Lavoie’s clean vocals. Likewise, the choreography resonates best in its quieter moments. There is a moment where two of the dancers stand closely together, undress, and explore each other’s naked bodies. Soft pauses. Gentle touches. Nothing is said, and it does not feel like anything has to be said. In this moment that breathes and takes its time, we are witness to human affection in its purest form. But then, in the show’s final piece, we are reminded of life as we share it together socially. The dancers change into fancy dress – cocktail dresses and suits. They open bottles of champagne and pour each other plenty (and then some). Besides quick whispers between the dancers, not too much is said. And not too much happens. It is as almost as if the dancers have slipped into disguises, masks; pretenses. The dancers look at each other from afar as though wanting to say something, but choosing not to. What keeps them from doing so? Whatever it is, the champagne eventually causes the dancers to throw caution to the wind. These impactful moments are scarce, stuffed away in favor of presenting something big and loud. Something so big, in fact, that at one point the stage lights flash so hard that the audience has trouble keeping their eyes on the stage. It is then that point that one ask themselves whether this is a dance show, a rock show, or an uneven effort in trying to accomplish both at the same time. The show’s main problem, though, is that Gravel seems more interested in speaking about the work than allowing the work to speak for itself. It is too bad considering that the work does at times succeed in stirring something intimately profound within us. Not to mention also that Gravel’s dancers, who move with vigor, feel terribly underused. Presented by Theatre Junction, Usually Beauty Fails’ integration of live music and dance is mixed at best, resulting in a show that sometimes grabs our attention, but mainly pushes us away. Frédérick Gravel & Groupe d’art Gravel Art Gravel Group’s Usually Beauty Fails ran at Theatre Junction, April 15 – 18.